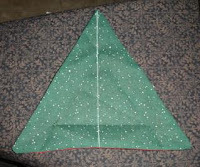 Below are two tutorials for a triangle tree ornament. The first tutorial was provided by Dorie and the second tutorial below was provided by shescrafty217. Both belong to the HGTV Quilting Needlework message board. Thank you ladies for sharing your instructions. Here is my version of shescrafty217's tutorial. I am still working on Dorie's version. Will post it soon. 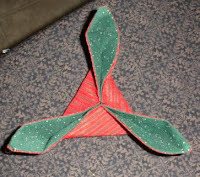 How to make a triangle ornament. Instructions provided by Dorie. 2. Mark a dot in the center of line, in this case it would be 3-1/8". 3. Position the point of the compass on the center point of line. Extend leg of compass so the pencil touches the outer point of your line. 4. Now draw a circle. 5. Position point of compass at one end of the 6-1/4" line and draw an intersect line through the circle on the left and right of where your compass is positioned. Do the same on the other end of 6-1/4" line. ** Let's say you want each of the 6 sides to be a certain length, such as 4". Then draw an 8" line and mark a dot in the center of line at 4". Each side is always 1/2 the radius. Continue at step 3 above. 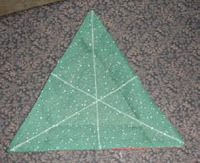 *** If you connect every other mark, instead of all six marks, you will end up with an equilateral triangle. Which you can use in the 2nd tutorial to make a triangle tree or click on the link provided in that section for another method. 1. Using the template cut out two contrasting color's of material. 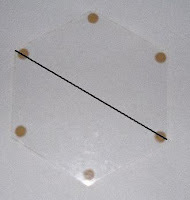 The template used measures 6-1/4" across from point to point. 2. 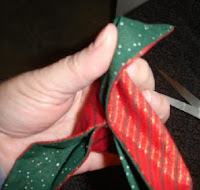 Cut a piece of ribbon to desired length to use has a hanger. 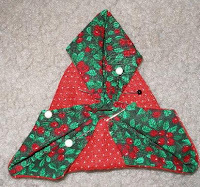 Position in the middle of one of the sides, keeping it tucked in between the two fabrics or attach it when ornament is completed. 3. 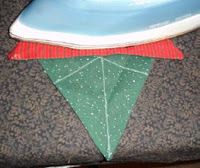 Sew the two pieces right sides together with 1/4" seam, leave a small opening to turn fabrics right side out. 5. 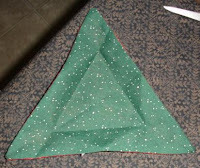 Lay out the shape with a flat edge at the top. 7. 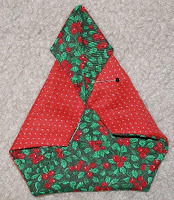 Fold left side in using the center side points as a guide. The folded edge should meet at the interest line in the center of hexagon. 8. 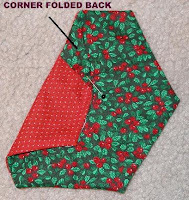 Fold back corner as pictured above and pin in place. 9. Now you will go to the corner on the right of the fold you just made. 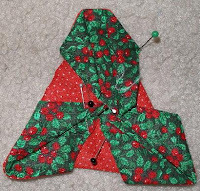 Using the center side points as a guide, fold towards the center and then fold back top corner and pin or go ahead and tack those two down at the bottom where they meet. 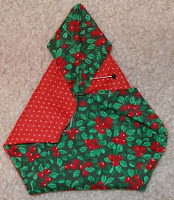 Fold back bottom corner. 10. 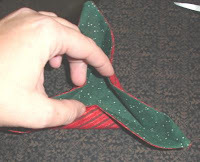 Continue folding sides in and turning back the corners. 11. When finished you can add a button or decorate it anyway you like. 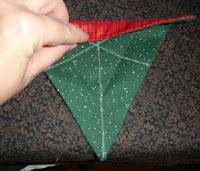 How to make a triangle ornament. Instructions provided by Shescrafty217. 1. 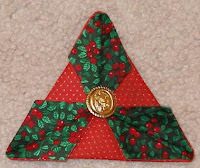 Cut two 9" equilateral triangles or choose a size you like. 2. 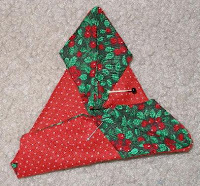 Sew right sides together using 1/4" seam allowance, leave opening to flip right sides out. Flip and press. 3. Mark center points on each side. Draw a line down the center of each side with chalk. 4. 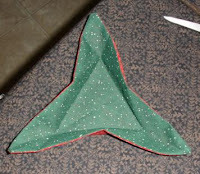 Fold each side evenly to center and press. 5. Press one side at a time this will give you the center triangle. 6. 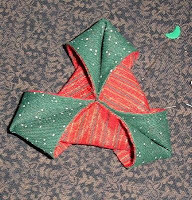 Start to pull in the folds to meet in the center. 7. 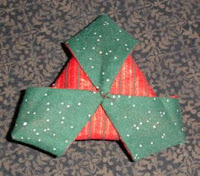 Tack each fold down in the center. 8. 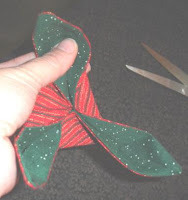 Begin to fold the little ears to the back where they will meet in the back center. Carefully tack then down. 9. Carefully tack down the back points. 10. Decorate the front as desired. Kathy, thanks so much sharing tutorial. These are really cute. Thanks for the tutorial. Vicki, Thanks! I am glad the ladies shared their instructions. Tattingchic, Thanks for stopping by. 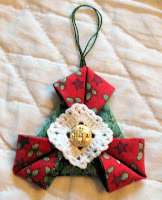 I love my tree ornament that you made, Kathy! Tutorials may be printed for personal use. 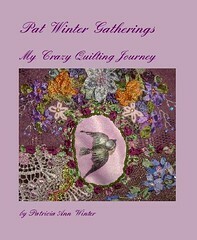 You may make for yourself and as gifts for friends and family. May not sell pattern instructions.